With my role at SikhNet I often find myself spending a lot of time capturing events through pictures, stories, videos and music. The goal is to share things that might inspire you and others. However, I find that sometimes this is at the cost of not really experiencing the event for myself. Either you are participating and experiencing, or you are capturing and watching what is going on. Over the years I have stopped some of the capturing and try to keep things balanced so that I have a chance to participate as well. Afterall, if my "cup" gets empty then I won’t personally have things to share. One has to make time to have personal moments as well. I know many people who burn out on doing seva. They serve and people always go to them to get help with this or that. Sometimes it becomes too much and they don’t take care of themself and become over burdened with responsibilities. It can then become a negative thing. As with all things in life, it’s a constant balancing act to serve others, yet take care of serving your own soul as well. Happy Vaisakhi to you all! Below are a few pictures that I took on Sunday during our Vaisakhi celebrations. I feel like I have taken so many pictures of the same events that I don’t take many pictures anymore. Click on the thumbnail and then you can browse through them. 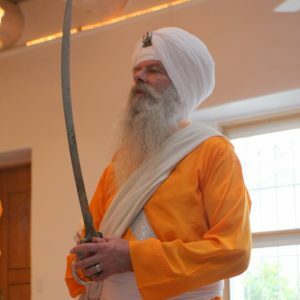 i hope that you are having a great Vaisakhi, and thank you for that live broadcast it was beautiful! Did anyone see Chardi Kala Jatha at Darbar Sahib yesturday, there kirtan was amazing!!!!!!!!! I was suprised when they done Jai Tai Gang as i thought they wouldn’t be allowed to do that! I have the same issues with documenting my kids. With Narayan I was way more on top with video cameras and still pictures. With my second child I’m a little more balanced. you have to build some equanimity so that you know when to slow down in your seva. the purpose is to keep your health so that u can do more seva in the long run. I know how you feel as in my family I allways end up with the video recorder in my hand filming other events and I think for a change I would love to be on the other side of the camera. and when I look back at these memories I would love to know how I felt during the occuasion. but it is also good when looking back at these memories to know that what I am seeing is bascily from my eyes. So you are right asin have a ballance. But it is also great to see memories when they are really happen and not from the cameras view but a camera is a everlasting memory so it’s your choice really but it is nice to be on the other side of the cmera once in a while. It’s the same with me. My poor second child going to have “not recorded” syndrome. Well, perhaps she’ll be balanced out by the fact that I am so much more capable of relaxing now that I figured out everything with the first child (victim #1!). I’m reminded of a quote from Yousuf Karsh: Look and think before opening the shutter. The heart and mind are the true lens of the camera. 114529166305747165 - One of the days in Singapore I went to "Santosa" and they had a cool aquarium. These were some cool looking jellyfish.